One of my former teachers in the States had a saying: "Some of us are made of elastic, and some of us are made of steel." I am solidly in the steel category. I studied gymnastics for years as a little kid and never even came close to a split. In my early 20s, I did things like running and playing ice hockey without ever stopping to stretch my muscles. I'm about the least bendy person ever. I know, I know - yoga teachers always say that sort of thing, and then the next minute they pull their foot behind their head. Well, not me. When I say my body isn't very bendy, trust me, it really isn't. For years I avoided yoga because I fell into the trap of thinking that yoga is about flexibility, and I didn't want to embarrass myself by going to a class and not even being able to touch my toes. When I finally did get to my first class, I was shocked to discover that there were quite a few people in that room who couldn't touch their toes - it wasn't just me! And what's more, it didn't matter in the slightest. The teacher told us to bend our knees and breathe. And so I did. At first I practiced intense, fast-paced styles of yoga, and found numerous benefits from those practices. But as I moved deeper into yoga philosophy and began to study the yamas and nimayas (yogic restraints and observances), I realized that they weren't quite right for my body. I found myself drawn to the first of the yamas, ahimsa, the practice of non-harming. Ahimsa involves living with kindess towards others and towards oneself. Practicing ahimsa means not pushing one's physical body beyond its limits. But also, and just as importantly, ahimsa means offering self-compassion and kindness in thought. When I truly listened to my body, I realized that I didn't need to push myself so hard in my physical practice. I'd spent most of my life running around, doing seven things at once, trying to achieve as much as I could. Practicing gentle yoga taught me how to finally slow down. Gentle yoga is a softer, refreshing practice which includes breathwork (pranayama), and slower postures and movement (asana) to promote healing and renewal in the body. For those of us made of steel, over time it allows tight muscles to begin to soften and release. Gentle yoga can also help to calm the mind, and promote relaxation. It's my favorite style of yoga, both to practice and to teach, and it is suitable for both beginners and advanced students - no previous yoga experience necessary! I hope you'll join me on Tuesdays and Friday mornings at Healium to try gentle yoga for yourselves. And together we'll bend our knees and maybe get that one millimeter closer to touching our toes. Valerie holds a 200-hour Yoga Alliance Yoga Teacher Training in Hath Yoga from Samadhi Yoga Studio in Manchester, Connecticut in the United States. Her specific area of interest is yoga's connection to physical and emotional well-being. Valerie followed her heart to Wellington in August 2011, and is a featured columnist on the Yoga Lunchbox, New Zealand's online yoga magazine: http://theyogalunchbox.co.nz/category/columnists/yoga-on-a-plate/. 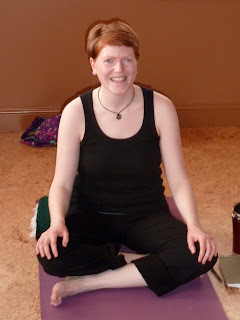 She also writes about her three favorite things - food, travel and yoga - on her blog at http://kiwiandkumara.com.